A balaclava-wearing, machete-wielding man has been left with serious head injuries after being mowed down by a speeding car as he chased down a rival with the sword-like weapon. The man was struck by the car in a suspected “target attack”, police said, being thrown approximately 50ft down a road by the impact. He was left in a serious condition, the collision having been of such force it nearly ripped his trousers clean off, after the incident in the Erdington area of the UK’s second city, Birmingham. It happened in broad daylight at 1.30 pm on Friday. Two men from Birmingham, aged 19 and 22, were arrested on Monday on suspicion of causing grievous bodily harm, Breitbart London can reveal. They have been released on bail while the investigations continue, West Midlands police said. A 28-year old was also arrested Friday on suspicion of assault and remains in custody, the force added. It is claimed the hit and run driver of the blue car was attempting to save the man who was being chased, The Sun reports, after obtaining CCTV footage of the dramatic clash. In the shocking video, the man’s accomplices stop and turn around as the blue car speeds away, allowing the pursued man to escape. They rush to help the injured man, attempting to drag him into a black getaway car. However, they are unable to move him. One removes his balaclava and appears to threaten a female bystander who may have got a clear look at his face. 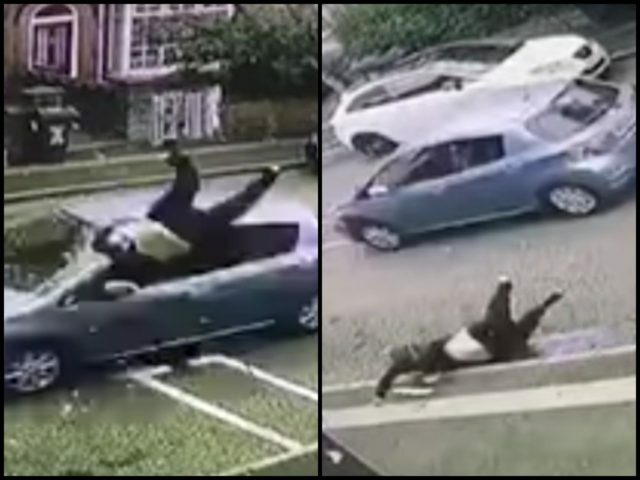 In the video, the driver later gets out of the suspected getaway car and the three men try for a second time to pull the fallen man in, but they soon give up. They get back in and flee, leaving their partner in crime unconscious. A spokesman for West Midlands Police told Breitbart London in a statement: “Police were called to Hillaries Road, Erdington, at around 1.30pm on Friday, August 17 to initial reports of a hit-and-run.